It was an evening full of media stars. As the Star Wars-themed presentation scrolled up the screen, members of American Horse Publications waited to learn the names of the warriors in equine publishing who would be recognized and rewarded for bringing excellence to the equine media galaxy. This year’s awards competition was judged by 28 professionals and included 64 classes, 770 entries, and 98 contestants, of which 65 were finalists. The awards presentation was held on Saturday, June 18, during the “May the Horse Be with You” Seminar, a jammed-packed three-day educational and networking conference held in Orlando, Florida, on June 16-18, 2016. AHP members came from all over the United States, Canada, and The Netherlands to applaud this year’s winners and enjoy a final night with friends, old and new. A reception co-sponsored by Dover Saddlery and Lumina Media, publishers of Horse Illustrated, Young Rider and HorseChannel.com, preceded the Awards Banquet sponsored by Zoetis. Breyer Animal Creations provided their Valegro model as centerpieces which one lucky attendee at each table took home. The General Excellence Award is a coveted honor for print publications and this year’s recipients included Mid-Atlantic Thoroughbred in the Association Publication circulation under 15,000 class, Chrome in Association Publication circulation 15,000 and over class, Driving Digest in the Self-Supported Publication circulation under 15,000 class, and Western Horseman in the Self-Supported Publication with circulation 15,000 and over category. All winners in the four General Excellence classes were eligible for the Overall Publication Award judged by a separate judge. The prestigious award was presented to Chrome, a quarterly western lifestyle publication published by the American Paint Horse Association. Publishing media members that achieved multiple honors in a variety of print and online categories included: Western Horseman with 20 awards; Chrome with 14 awards; The Chronicle of the Horse with 10 awards; Mid-Atlantic Thoroughbred and Paint Horse Journal with 9 awards each; The American Quarter Horse Journal with 6 awards; Daily Racing Form, Hoof Beats, Modern Arabian Horse, and The Horse: Your Guide to Equine Health Care earned 4 awards each; and American Farriers Journal, Dressage Today, Equine Journal, EQUUS, Horse Illustrated, Keeneland Magazine, New York Horse, Pracitcal Horseman, Quarter Horse News, and Smart Choices for Horses, each received 3 honors. Other publishing media members that won or placed included American Racehorse, America’s Horse, Barrel Horse News, Blood-Horse, California Horsetrader, Driving Digest, Equisearch, Eventing USA, Flying Changes Magazine, Holistic Horse, Horse & Rider, Quarter Horse Track, Sidelines Magazine, Speedhorse, Spin to Win Rodeo, The Saratoga Special, Untacked, USHJA in Stride, and Western Horse and Gun. Seventeen freelance journalists and photographers who are AHP Individual members, received top honors for material they entered in the competition. Among the multiple award winners were: Julie Kitzenberger who earned 4 awards in writing and photography including wins in Feature Single Article and Freelance Editorial Photographer; and Jennifer Bryant with 3 awards for articles published in USDF Connection. Members with first place awards included Melinda Brown, Susan Count, Marsha Hayes, Kaitie Marolf, Kelly Sanchez, and Scott Trees. Individual members who also placed were Abigail Boatwright, Tania Evans, Bonnie Gruenberg, Jennifer Keeler, Douglas Lees, Morgan Nati Esq., Katie Navarra, L.A. Pomeroy, and Kara Stewart. Among the AHP freelance members whose work was entered by an AHP publishing media member that placed were Jean Abernethy, Abigail Boatwright, Natalie DeFee Mendik, Ange Dickson Finn, L.A. Pomeroy, Susan Quinn Esq, Kelly Sanchez, and Linda Yutzy. AHP Business members entered their work from 2015 in the separate Business Division. Multiple award winners included Manna Pro with 7 awards including first place in Equine-related Marketing Video and Business Equine-related Single Online Advertisement; Farnam with 6 awards including wins in Business Equine-related Single Print Advertisiment, Business Equine-related Brand Multimedia Campaign, Business Brand Equine-related Blog, and Business Brand Equine-related Custom Publication; SmartPak with 3 awards including a first in Business Brand Content Marketing Single Article; and Kentucky Equine Research with 2 awards including a first in Business Equine-related eNewsletter. Earning first place awards were Boehringer Ingelheim Vetmedica in Business Brand Equine-related Website; and Schleese Saddlery Service Ltd, in Business Equine-related Print Ad Campaign. Other Business members who placed in this division were Freedom Health, LLC/SUCCEED, Horseware Products, and Washington International Horse Show. AHP congratulates the members who achieved excellence in equine publishing and encourages all communicators to strive for excellence in journalism for the horse industry. Rules for the 2017 Annual Awards Contest for material published in and dated 2016 will be available to members in early January. 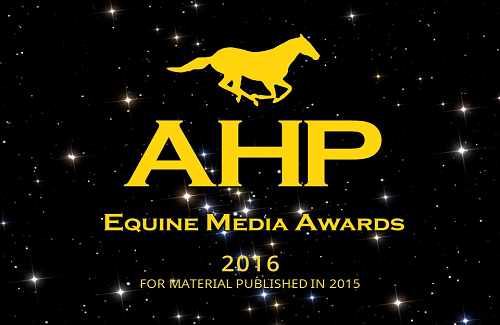 American Horse Publications is a non-profit association promoting excellence in equine publishing media. Its members include equine-related print and online publishing media, professionals, students, organizations, and businesses which share an interest in equine publishing. For further information on the awards competition or member benefits, contact: Chris Brune, American Horse Publications, (386) 760-7743 or visit the AHP web site at www.americanhorsepubs.org.